Scuba divers describe the PADI Rescue Diver course as the most challenging, yet most rewarding course they’ve ever taken. Why? Because you learn to prevent and manage problems in the water and become more confident in your skills as a diver, knowing that you can help others if needed. During the course, you learn to become a better buddy by practicing problem-solving skills until they become second nature. Plus, the course is just fun – it’s serious, but still allows for lots of laughter in between the focused learning. PADI (Junior) Adventure Divers who are at least 12 years old and have completed the Underwater Navigation Adventure Dive may enroll in a Rescue Diver course. You also need to have Emergency First Response Primary and Secondary Care (CPR and First Aid) training within the past 24 months. eLearners will take their PADI Quick Quiz if they have completed the online portions. To Get Started Right Away…. The PADI Rescue Diver course prepares you to deal with dive emergencies, minor and major, using a variety of techniques. Through knowledge development and rescue exercises, you learn what to look for and how to respond. 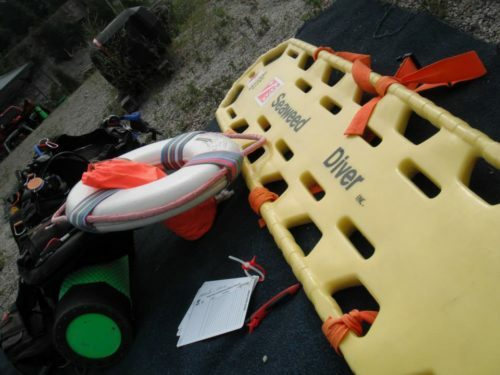 During rescue scenarios, you put into practice your knowledge and skills. If you prefer, you can choose to study with the Rescue Diver Manual and watch the Rescue Diver Video (a book and DVD package).